I love being me and I loved making this canvas. This was all about learning new styles, having fun espressing myself and sharing a bit of myself with all of you. First off why do I love being me? I have seen God's blessing and miracles in my life. I have a precious little boy who just made the top score on a math bench mark at school. Great achievement in itself, but made even more incredible because his doctors told me when he was born at 1 pound 11 oz. that he wouldn't be able to learn and would be very sick. A miracle! I also have a beautiful boy who is about to graduate high school on June 10th. Miracle and a Blessing! And......my middle son is the most amazing tuba player who tells me he knows he made 100 on his TAKS test. What a blessing! My husband has been the love of my life for 26 years. A Great Blessing. Now....I get to scrap for TCS! I am very blessed. Making this canvas was so much fun! Since I am a hybrid scrapper, I wanted to use the best of the digital and the paper world. My crown and wings are from my friend Fantacy Bryant. The button, list and leaf are from Weeds and Wildflowers. Then I added the Simply Luxe paper as a border and stickled it all over! I also Stickled my canvas. The B was a great project that Caroline from Maya Road shared with us during a make and take at the birthday crop. The chipboard was painted stamped and covered with UTEE and heat set. It was mega fun! So...this is me...my blessing inspire me and fill me with such joy, that I just have to scrap about it! One of the most enjoyable things about being on the design team is getting to create projects that other folks outside of my immediate family will see. This is my version of an 8x8 canvas that Carolyn asked each member of the design team to create. I didn't have a picture (photo) of me that I wanted to use, so I used words to create a picture of who I am. All of the canvas art will be on display at the store on National Scrapbook Day. I personally just can't wait to see what everyone has designed. The talent in this group simply amazes and inspires me! If you are in town, be sure to visit the store so you can see ALL of the canvas art created by the design team. I finally finished my canvas challenge Carolyn gave us last month. She wanted us to do whatever we wanted to an 8x8 canvas. So...what to do....?? I always create best through something that inspires me. It is often a new product I am experimenting with. Sometimes it is a great photo or story that must be told. Other times it is an instance of my life journey, something I am going through and, usually, a lesson God is teaching me. THAT was it this time. 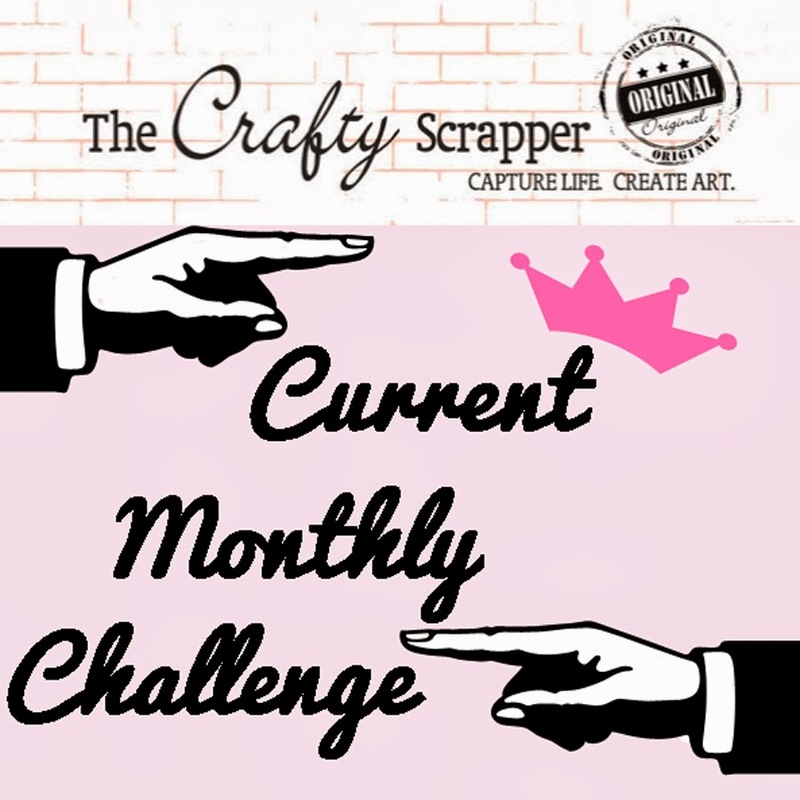 I have been challenged by parenting (aren't we all?!) and am reading Bringing Up Boys by James Dobson. It was confirming to me of my role in my son's life as teacher, caregiver, and guide. And this is the thought process that came about: So ALL the distractions around me are not what I should remain focused on. Being a mom and doing the "little things" really do matter. The verse in Jeremiah was on my heart..."For I know the plans I have for you, says the Lord...". If I just look to God, He will show me the best plan for my life and that will be what is best for my son as well. So there you have it. My inspiration. My son. My faith. My art. Well Brooke's April challenge has come to an end and I wanted to post my layout. Two post in one week......miracles do happen.....what can I say I am on a roll this week. The challenge was to take lyrics to a song and make a layout. Well "Say" by John Mayer is one of my new favorite songs and this picture of Matt is also one of my latest favorites so I thought I would put them together. I think they make a perfect match!!! I took this picture at my niece's wedding a month ago and have been dying to scrap it. He looks so handsome, so grown-up and in deep thought. It was a staged shot but it still love it, it's no MarieQ by any means, but I'm proud of it and it envokes so many memories in my head of when he was little and he is growing up to be such a fine young man. Oh by the way....Matt is being recognized as an "outstanding" student in the Coppell ISD on May12th at the the Texas Rangers Game, isn't that great, more pictures to be taken....he is so proud of himself....and he should be, so am I! Saturday Crop 8am-2am $60 Includes breakfast, lunch, dinner, make-n-takes throughout the day from the design team and one from Ten Second Studios. More prizes and giveaways and 18hrs of cropping. Sign up for both days and receive $10 off. Call us at 972-923-3151 and reserve your spot today. Today we went with our friends the Davis's to help celebrate Drew's 7th birthday. Drew's mom, Paige, and I were talking about how they have been friends since they were 1 1/2yrs old, we potting trained together, did mother's day out together and they have played soccer, t-ball and basketball together since 3yrs old.....how time flies and they are getting older. As you can see it was perfect day, with perfect seats to watch the Rangers win 10-0 over the Twins. It was a good game with a lot of action. Its hard to see but on the bottom 5th they had Drew's picture up in the screen and his name. The boys had a great time, even the bigger boys! You gotta love these two, I always seem to give them a hard time.....but in truth they are both great dads and great assistant coaches on our sons team. I couldn't imagine a outing without them! LIFE LESSONS -----GOOD OR BAD? It started with a box....and from there my imagination took flight. Annette gave me the task of coming up with a class that could celebrate Grandparents Day and I took it a little further. This class could work for several ocassions that are coming up over the next couple of months. Grandparents Day, Mother's Day, Father's Day...whoever has taught you lessons about life. I didn't have the priviledge of Grandparents growing up (not like my boys...they even have great grandparents) so all of my lessons were learned from my parents. Good or bad...they are all lessons. I really had fun this week coming up with this class and I hope you enjoy what I've posted here. The front of the pages were so fun to come up with words. I think you can tell I like to use words when I'm doing a book. Is there a name for my kind of people? 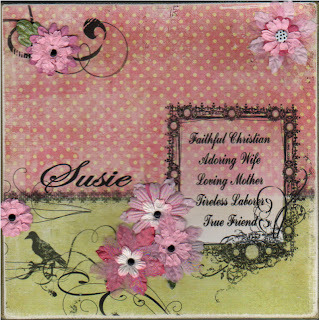 I used lots of little stamps that are currently available at where else...."The" Crafty Scrapper. 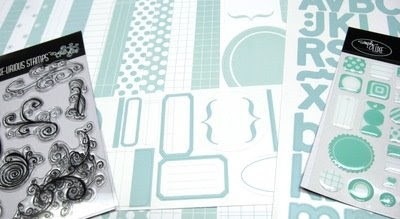 It is fast becoming my favorite stamp store along with scrapbooking supplies. Carolyn has really out done herself on the new lines coming out. Oh yeah!!! Martha Stewart has arrived at The Crafty Scrapper....and all her glitter glory (I'm going to have every color you know!). I haven't had the chance to finish the back side of the pages yet. I've got to go and get some pictures reprinted in a smaller size, but you get the idea. This is a great little book that can be done fast and with all the great Fancy Pant stuff it makes it so easy. Don't you just love double sided papers. I didn't use to but I've become a huge fan. As you can see I have been hard at work this week creating a fun and special class, designed especially for those we wish to thank for all they have taught us. 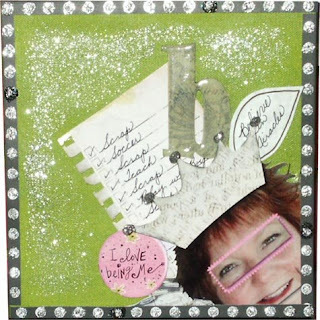 See you soon, at the Crafty Scrapper, hopefully in my class. If you do not know what GASC is, its the Great American Scrapbook Convention in Arlington June 5-7th. This year our booth will be #317-319, we will be hosting the crop party on the 4th and teaching 2 classes. We are teaming up with the girls at Ten Second Studio and making this adorable townhouse from Maya Road and new papers from Pink Paislee. 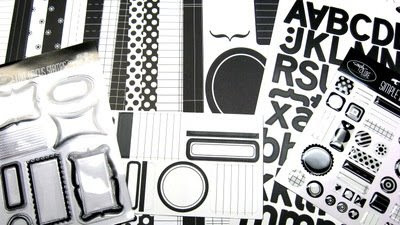 You will learn about the metal and how to incorporate it into you scrapbooking, try out the new misters made with distressing ink and perfect pearls and play with lots of chipboard. We may change a few things, add a little here and there, but here is a rough draft of what we will be teaching. We just added 25 more spots to Friday, but they are filling fast so sign up so you do not miss out. Most of you know that Sherri's mom has been in town the last 3 weeks so she hasn't been working. Well Wednesday morning I came in and almost fell over these wood shelves on the floor, when I looked up I noticed a old pie safe in the window filled with the new cooking paper. Yesterday afternoon she came in after I left and said she was going to play with the displays, when I got home I was a little nervous. I called up to the shop and MaryLou said she took everything off the Creative Cafe wall....OK by now I am getting really nervous, you see I had a plan for where all the new stuff was going to go when it came in. I decided to wait until today to come see........and as usual I loved everything she did! The Art Bar will still be used for all our make-n-takes, and now displays all the Ten Second Studio projects. It also will showcase the canvas's each design team member made to express themselves. And if you haven't been in this week all the Martha Stewart glitter is in......and this is where you can find it.............THANKS SHERRI FOR A GREAT JOB! I will post pictures of the kitchen window she did with the pie safe tomorrow.......................and what ever else she did after I left today! This past Saturday was the stores 3rd anniversary, and boy did we celebrate. Everyone received a birthday bag with goodies, and throughout the day we gave LOTS of goodies away. I was so excited when Caroline with Maya Road, called and said she wanted to come down and do make-n-takes. I even learned a few new things. After lunch I told her husband, David, that he and my husband were going to do a special make-n-take with the metal. I told him to go pick some chipboard out, he came back with one of their new Maya Road People chipboard albums, and the excitment on his face was priceless. Wish I could say the same about my husband! 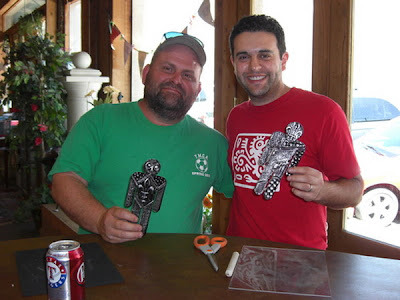 At first they were a little scared of all the tools, but then they really got in to it, and actually created some awesome metal chipboard men. Don't they look proud of themselves! Some of the ladies bought chipboard people and took their example to copy....you guys are setting a new trend....lets here it for the guys, HOORAY! After Caroline, David and her adorable son, Noah left, Cheryl and Megan with Ten Second Studios came to demo their metal products. I LOVE to be around these two, they are creative, funny and have the best personalities. Everyone got into the metal, some already had tools and have never taken them out of the package. Before they left they gave away a $100 tool kit for a drawing, Gena was the lucky winner! If you have not tried the metal, they are coming back May 17th to teach 2 different classes, be sure and check out the events page on the web site. Gail was quite proud of her frame, these went on the celebrate canvas that everyone received at the crop. We even had time to celebrate Stacie's birthday, I think she was turning 21! HAPPY BIRTHDAY STACIE....WE LOVE YOU! And what a great end to a fantastic weekend, I opened the Sunday paper and saw that I had received business of the week. Thanks to all of you wonderful customers for supporting us the last 3 years. Before I tell you about the chipboard, I do have to say that I just had the most awesome time at The Crafty Scrapper's Birthday Bash! Oh my Gosh, it was HOT! Forty Percent of an item of your choice, two make and takes by Maya Roads and one by Ten Second Studio! I was happier than a little pig in the corn! So....I wanted to share with you some treatments you can use on your Maya Roads chip board letters. 2. Cover them with paper and file the edges. I really love using the Basic Grey Files for this. I did this in the Happy Birthday Daddy LO. 4. Paint them and doodle on them. I just can't get enough of these Maya Roads chipboard embellishments! They are so much fun to use! I would love to hear about how you alter your Maya Roads chip board too. I wanted to put a layout together for this picture of my grandbaby. When I saw the Pink Paislee line, I knew it would be fun and work really well for this picture (to me). The line has a sheet of die cuts including the frame shapes. I punched them out and then had them laying on the paper while I punched out some of the smaller die cut shapes. A happy accident. I have a lot of those. As I looked at the paper frames laying there, I saw that it might be cute to overlap them and have them overlapping and angled on the page. So that is what I did. I left this as a one picture layout, but it could hold several pictures 4x6 sizes. I made a little chipboard backing and painted it with the Tim Holtz blue (broken china) crackle paint. Along the left side I stamped with a Fancy Pants stamp, using Nick Bantock inks in green leaf, rose madden and a yellow. I tried to get the pink on the flower portions and the green on the stems, and then I put yellow over all of it, it almost looks like I did it on one of those rainbow/spectrum ink pads. I really like the brightness of the Bantock inks. Anyway. Quick, easy and I used two sheets of paper and the sheet of die cuts. Show me something you made this week! Luxe is running a little challenge in their office. I talked to Emily from Luxe last week about our customers doing the same challenge. We are asking you to "simplify your stash". Luxe just released their new line Simply Luxe. 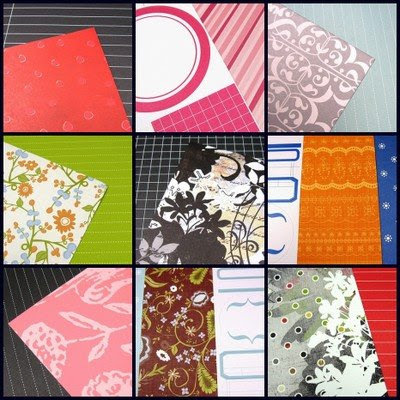 We are challenging you to pick one of the core colors and match it to your paper stash at home and complete a layout. There will be 3 winners, each will receive a RAK from the new Simply Luxe line. Deadline for all entries is May 6th, email your entries to carolyn@thecraftyscrapper.com, then our design team will pick the winners. If you are local you can find the complete Simply Luxe collection at our store. If you are out of state you can find it HERE or call the store 972-923-3151. Here is a look at two of the core colors from Simply Luxe line, there are 6 papers, sticker label sheet and alpha sticker sheet to choose from in the 6 core colors. 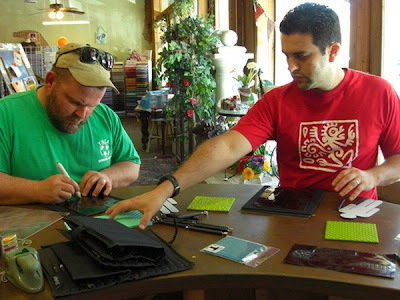 Megan flew in from Utah Friday night to teach a class, making a canvas accordion album. The store was packed with ladies excited to meet her and take the class. Of course we had to have cupcakes from Two Sisters Lunchbox Cafe! Annette even took a break from teaching classes to attend this one. She said it was fun and a change to be the student. Lots of prizes were given away throughout the night. 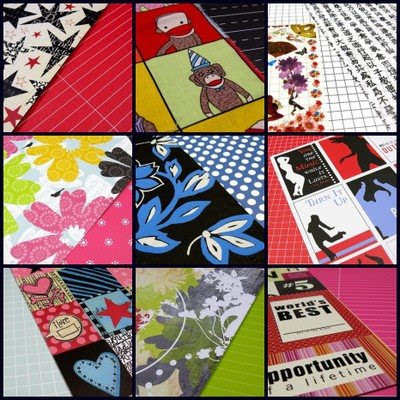 Kimberly was excited to receive this goodie pack of 8x8 paper pad and their new stamps. Shawna was into her project she never knew I was behind her...SURPRISE SHAWNA! Brook has the happy look on her face. We topped the night off with a group picture. The only place to fit all of us were the stairs, sorry some of you faded at the top. THANK YOU SO MUCH FOR COMING MEGAN WE ALL HAD A BLAST AND LOVE DAISY D'S! My mother has a brand new craft cottage. It is just a little place all her own where she can create and dream. "Come in, come in!" Mom says. "Why don't you stay and make yourself comfortable?" When you first walk in, you see her machine ready to sew away. Pockets for her embellishments and stickers. Plus her great monograms. I love the details on the monograms. There is a little something to represent each of the special people in Mom's life. My mom covered the top of the shoe bag. Too cute! My Daddy made Mom this great little table the perfect size for making cards or layouts. My mom made the cute little curtains. One thing about mom is that I can always count on cute little whimsical details. I wonder who Mom thinks of when she sees this cute little angel. Two sweet little birdies. Sam loves these guys. I love all the pin cushions that she is making. The mouse is precious. There is also a donut that I can't believe I didn't get on film. The little bird's nest are too cute. This is a little sitting area. I think a comfy chair is soon to come. The area is perfect for her cutting table. Mom has a lot of storage for all her materials and supplies. My mother and father have worked really hard to make this happy spot. It is a great little place. I think every crafter needs a place like this! Thanks for the tour Mom! I can't wait to come again and play! What's on my work table?